Most people have eggs and cheese in the fridge, which are the basic building blocks for this easy broccoli and cauliflower frittata recipe. 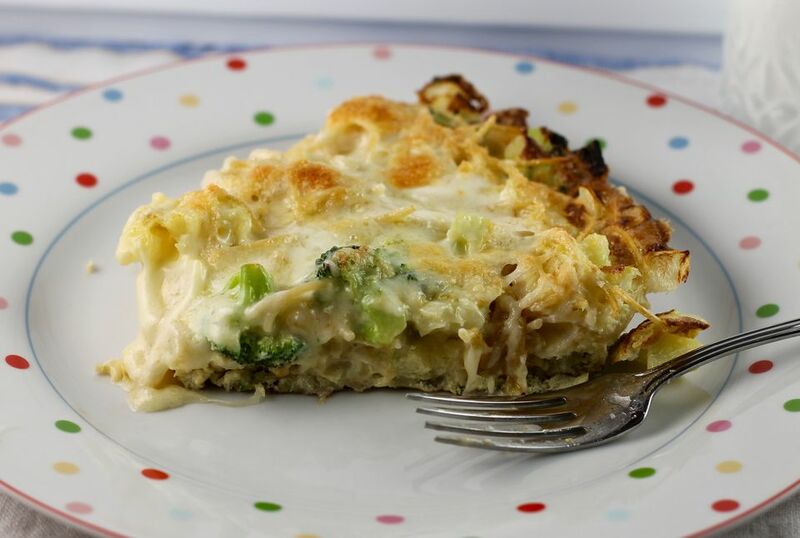 The combination of cauliflower, broccoli, onion, and garlic, cooked until tender in a frittata topped with tons of cheese is just spectacular. You don't have to add the leftover cooked pasta if you don't want to. This recipe is complete without it. But it does add interest and it's a great way to use up leftovers. Frittatas aren't just for breakfast, they make great brunch, lunch, or dinner meals, or late-night snacks. All you need to serve with this dish is a green salad or a fruit salad and a glass of white wine. For dessert, a nice brownie, or some ice cream topped with fudge sauce would be just perfect. In a 12-inch nonstick ovenproof skillet, melt the butter with the olive oil over medium heat. Add the onions, garlic, broccoli, and cauliflower. Cook over medium heat, stirring occasionally with a heatproof spatula until the vegetables are crisp-tender. Then add 2 tablespoons water to the skillet, cover, and steam for 2 minutes, at which point the vegetables should be tender. Arrange the pasta on top of the vegetables. Pour the eggs over all and sprinkle with the thyme, salt, and pepper. Cook the frittata, lifting the edges occasionally to let uncooked egg flow underneath and wiggling the spatula in the center of the frittata so the egg can flow under and cook evenly until the bottom is lightly browned and the frittata is almost set. Shake the pan occasionally so the frittata doesn't stick. Heat the broiler. Place the frittata under the broiler, about 6 inches from the heat source, and broil for another 4 to 8 minutes or just until the egg mixture is set. Remove the skillet from the oven. Sprinkle the frittata with both kinds of cheese. Put it back under the broiler. Broil for 3 to 6 minutes longer, rotating the skillet occasionally so it cooks evenly until the cheese is melted and begins to brown. Cut the frittata into wedges and serve immediately.